I haven’t said a whole lot here about our move. Maybe that’s odd, given it’s the biggest thing happening in our lives right now. It’s a little tricky to know what to say, though, because circumstances seem to change on a daily – sometimes almost hourly – basis. The bottom line is that nothing about our plan to move has been simple. It was a difficult decision to make, and now that the ball is rolling, it’s a bumpy ride. I won’t drag you through the minutia and mini-dramas; I subject my parents and a few close friends to that and hope they still love me when it’s over. Suffice it to say we currently have no idea exactly what lies ahead. We made the decision this week to walk away from the house we were contracted to buy due to growing concerns about the property, and we are facing some challenges in the sale of our home, as well. We continue to pray to the only One who knows all ends and trust we’ll come out of this where He wants us to be. I have a suspicion I’m being allowed another growth opportunity, because a state of limbo is my very least favorite place to be. I do not like uncertainty. I want to make plans, take action, forge ahead. I am getting a lot of practice at doing the exact opposite: sitting back, waiting patiently (ahem), allowing circumstances to unfold. It does not come naturally. I realize in times like this that for all my talk about faith through the unexpected, it’s still an area where I struggle. I trust that God is going to work all this out. I really do. I just wish He’d give me a peek ahead so I don’t have to do all this waiting and wondering! 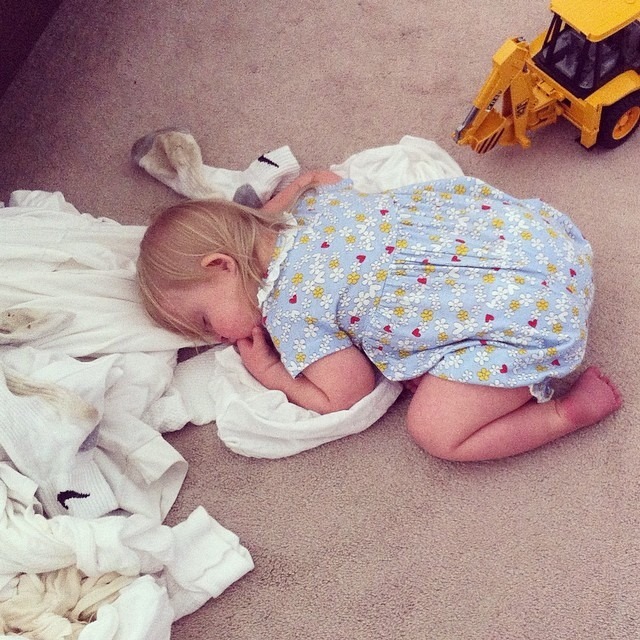 Poor, sick baby fell asleep on the dirty laundry. And then, today, Lina had an audiologist appointment. (I realize I’ve buried the lede here…) Because of her early diagnosis of conductive hearing loss, she goes in for periodic hearing tests and checks on her bone anchored hearing aid. The booth hearing tests they use can be problematic for young kids. They hadn’t gotten great results from her previously, because she wasn’t fully participating in the test. I had low expectations for today’s appointment. Imagine my surprise when Lina turned immediately in response to nearly every noise the audiologist played through speakers, over a range of frequencies and volumes. Girl tested at normal hearing, without her hearing aid! They will repeat the test in three months, and if the results are similar, they will remove the conductive hearing loss diagnosis. It was pretty exciting news, and a huge relief for me. I’ve struggled with a lot of guilt over how little use Lina gets from her hearing aid, thanks to her refusal to leave it on her head. I can now silence the guilt gremlins and know that my baby girl is likely hearing me just fine. In a week of plentiful challenges, I’m so grateful for the win on this one. We arrived home last night from a weekend in North Georgia, where Jon and I attended our 15-year high school reunion. (Every five years, I am reminded how nice it is that we share our graduating class.) The showing was small, but we had fun catching up with former classmates and revisiting the campus where we met and spent a lot of happy times. It usually seems a lifetime ago, but being on campus, where so much is the same (including that awful mural our class painted in the religion room), it felt like yesterday. I badly missed someone, though. Jennifer, my best friend from those GCA days, died this past November. As I flipped through yearbooks, I paused over so many pictures of a cute, smiling blonde who also occupies so many of my memories from that place. She should have been there, flipping through those yearbooks with us. I talked about her a little, but I thought about her a lot. In today’s news, Lina had her first appointment with a pediatric ENT at Vanderbilt. (Actually, we were scheduled to meet with the nurse practitioner.) It was not a picnic for either of us. You may remember that Lina failed two newborn hearing screens in the NICU. She was then referred to the audiology department at Vanderbilt for a follow-up screening that showed moderate conductive hearing loss in both ears. This means something is preventing the sound from clearly reaching the ear drums: in this case, likely a build-up of fluid. The audiologist described Lina’s hearing as sounding like she was under water. Another follow-up screen showed continued blockages in both ears, as did a repeat test today. I’ll try to shorten our 3 1/2-hour experience to the cliff notes. We met with the nurse practitioner, who indicated we would be scheduling an appointment to place ear tubes to drain the fluid, which should significantly improve Lina’s hearing. She walked me through the relatively simple procedure, answered my many questions thoroughly, and then sent the nurse in to provide further information on follow-up care. We were then to meet briefly with the ENT himself, who would be the one to do the procedure. He was brusque and rushed, but the summary is that he was concerned about the size of Lina’s ear canals. He wanted to verify they were actually big enough to place the tubes. He was not able to see to the ear drum due to a build-up of wax. Thus commenced a thoroughly unpleasant experience in which he used a metal tool and then a suction device to remove wax from a strapped-down, wailing Lina’s ears while the nurse held her head still and I wiped her tears (and struggled to hold myself together). The final verdict is that Lina’s ear canals are definitely too small for tubes. Her canals will grow with time, so we will go back in August for a re-check. In the meantime, we have been referred back to the audiology department for a bone anchored hearing aid. In adults, an implant would be attached to the skull bone, but in Lina’s case, they will use a headband to hold the device in place. I have more learning to do about this – an informational DVD is awaiting my attention – but the gist is that this aid will help bypass the blocked canals to improve Lina’s hearing at a time critical to speech development. It was a tough day. I am feeling better tonight, as I’ve had time to process and recover from the trauma of the afternoon. We know Lina’s diagnosis of Down syndrome will mean a series of challenges to be faced in their time. This is today’s. We will do whatever is necessary to give her the best chance of hearing and learning speech. A few bright spots of the day: Corin was so, so well behaved through that entire appointment, brandishing his new toy stethoscope in the real doctor’s office. And all the office staff thought Lina was so cute. Because, let’s face it, she is.